Bright dark ruby color. Fruity aromas of blueberry compote and cherry pie with a satiny, crisp, dryish light-to-medium body and a smooth, refreshing, medium-length tea and black pepper finish with crunchy tannins. A Pinot Noir bursting with purple fruit and table-friendly tannins. 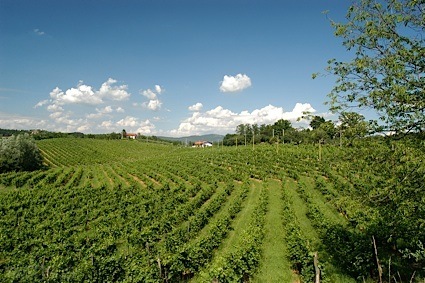 Bottom Line: A Pinot Noir bursting with purple fruit and table-friendly tannins. 91 • City Winery 2014 Scopus Vineyards, Chardonnay, Sonoma County 14.1% (USA) $28.00. 93 • City Winery 2013 Alder Springs Vineyard Reserve, Pinot Noir, Mendocino 13.5% (USA) $38.00. 91 • City Winery 2013 Bien Nacido Vineyard Reserve, Pinot Noir, Santa Maria Valley 14.1% (USA) $38.00. 88 • City Winery 2011 Alder Springs Vineyard Kosher, Syrah, Mendocino 14.3% (USA) $49.00. 90 • City Winery 2015 "Soho-vignon Blanc" Windrem Vineyard, Sauvignon Blanc, Lake County 14.1% (USA) $18.00. 89 • City Winery 2015 "Soho-vignon Blanc", Sauvignon Blanc, Lake County 14.1% (USA) $18.00. 91 • City Winery 2012 Brut Nature Sparkling, North Fork of Long Island 12% (USA) $49.00. 88 • City Winery 2012 Reserve, Cabernet Sauvignon, Napa Valley 14.1% (USA) $36.00. 93 • City Winery 2014 Haystack Peak Vineyards Reserve, Cabernet Sauvignon, Atlas Peak, Napa Valley 14.1% (USA) $36.00. 93 • City Winery 2013 Bettinelli Vineyard Reserve, Cabernet Sauvignon, Yountville, Napa Valley 14.1% (USA) $36.00. 84 • City Winery 2015 Scopus Vineyard Reserve, Chardonnay, Sonoma Mountain 14.1% (USA) $26.00. 90 • City Winery 2015 Vin de Glaciere Uva Blanca Vineyard, Riesling, Finger Lakes 11.9% (USA) $22.00. 89 • City Winery 2012 Brut Nature, North Fork of Long Island 12% (USA) $49.00. 88 • City Winery NV Chazak Red Dessert Wine 15.5% (USA) $25.00. 94 • City Winery NV Chazak Dessert Wine, California 15.51% (USA) $25.00. 91 • City Winery 2015 Reserve, Cabernet Sauvignon, Napa Valley 14.5% (USA) $38.00. 90 • City Winery 2016 Scopus Vineyard Reserve, Chardonnay, Sonoma Mountain 13.5% (USA) $28.00. 93 • City Winery 2016 Alder Springs Vineyard Reserve, Pinot Noir, Mendocino 13.5% (USA) $36.00. 91 • City Winery 2016 Hyland Vineyard Reserve, Pinot Noir, Willamette Valley 12.8% (USA) $36.00. 87 • City Winery 2017 Rooftop Rosé, Syrah, North Coast 12.5% (USA) $17.00. 87 • City Winery 2016 Downtown Local Alder Springs Vineyard, Roussanne, Mendocino 14.2% (USA) $.00. 93 • City Winery 2015 Alder Springs Vineyard Reserve, Syrah, Mendocino 14.1% (USA) $38.00. 92 • City Winery 2017 Scopus Vineyard Reserve, Chardonnay, Sonoma Mountain 13.5% (USA) $28.00. 90 • City Winery 2016 Bacigalupi Vineyard Reserve, Pinot Noir, Russian River Valley 14.1% (USA) $42.00. 90 • City Winery 2016 Hyland Vineyard Reserve, Pinot Noir, Willamette Valley 12.8% (USA) $36.00. 88 • City Winery 2016 Alder Springs Vineyard Reserve, Pinot Noir, Mendocino 13.5% (USA) $36.00. 89 • City Winery 2016 Downtown Local Alder Springs Vineyard, Roussanne, Mendocino 14.2% (USA) $28.00. 92 • City Winery 2016 Au Naturel, Syrah, Santa Barbara 14.1% (USA) $32.00. 90 • City Winery 2017 Scopus Vineyard Reserve, Chardonnay, Sonoma Mountain 13.5% (USA) $28.00. 92 • Wiseman Cabernet 2012 Haystack Peak Vineyards Kosher Reserve, Cabernet Sauvignon, Atlas Peak, Napa Valley 14.1% (USA) $36.00. 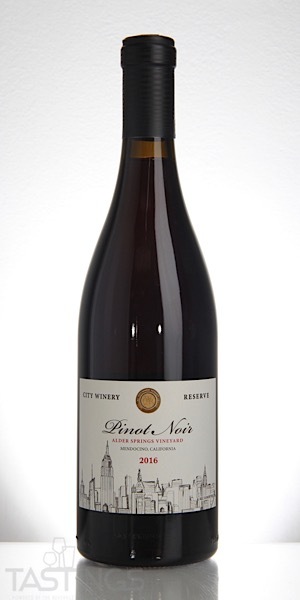 City Winery 2016 Alder Springs Vineyard Reserve, Pinot Noir, Mendocino rating was calculated by tastings.com to be 88 points out of 100 on 12/5/2018. Please note that MSRP may have changed since the date of our review.